Mount a better sign that reaches out to a different audience. SALIDA Exit Signs meet UL924 code and make a difference. • These damp location rated Exit Signs provide bright LED illumination in a blackout situation; battery backup is included with this unit. • A Universal Canopy is included for easier installation. 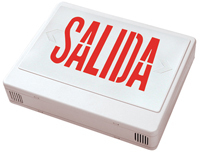 • This SALIDA Exit sign includes universal knock-out chevrons and SALIDA faceplates. • Features sturdy, thermoplastic housing that is completely self-contained. • Black housing is not available with this unit. Please select the color of the housing. Factory default is pre-selected. Size : 22" x 7.25" x 15"